This blog post may jump around a bit...but will start out with this shot of how far along my lilac is! Even though I have looked out at it and noticed it was budding out, it surprised me that it is actually this far along. It is this late in the spring, and I have still not cleaned off my flower bed...it is the same bed that Mabel lived in all summer. This is Mabel. I don't think I told you that this was her name...she is Charlotte's cousin. Instead of staying on the farm she ran off with a traveling salesman and moved to the city. At least that is part of the tale that I told Lorelei. Anyway, somewhere I read that the spiders might survive the winter if it was mild, so I have hesitated to clean off the mess. But I doubt she survive, but I sure hope some of her offspring are out there this year. The clouds were awesome the same day I took the other pictures. Notice the Turkey Vulture in the upper right corner. They are always around...at least some of every day. Just have to show this pic of the house sparrow...it was in a tree across the road. I am still amazed that my little Canon SX 700 HS will take a picture even half this good...handheld. I have issues with it sometimes, but still, I have got a lot of bang for the buck in this little camera. Your corner of the world is looking pretty good! Love seeing your Hyacinths. Great photos and tack sharp. Wonderful 'Pics and Pieces of Spring. I hope Mable's offspring is lurking out there somewhere. Awesome photos today, Rose! That Spider looks crazy huge!!! Awesome shot, I love the one of Mabel, tho I'm not crazy about spiders. I love your wee tale about Mabel, she was obviously happy in your garden. I just love that Spring time is here. I love the photos here. Oh I love a garden! Including spiders!! That is one very big spider. Awesome photo. I loved your Mabel story. 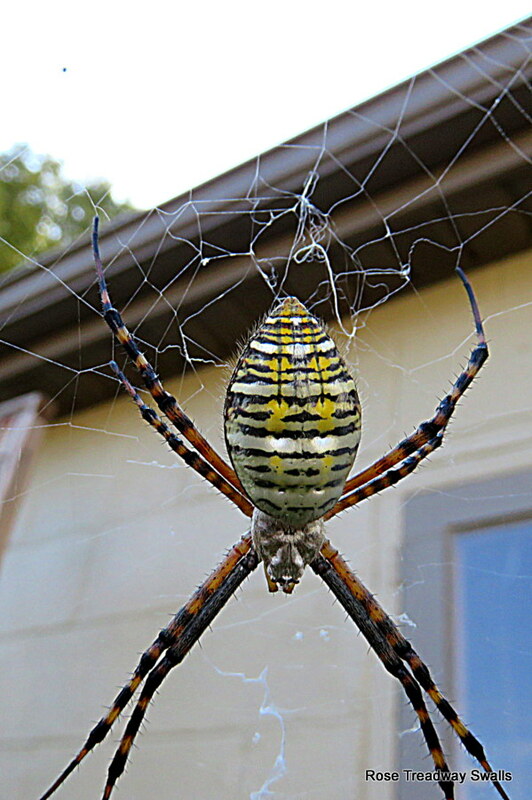 I had a spider like yours in my garden last summer. Hope he is still around. I love that video in your last post. Little Big Shots is my new favorite show too. There's not much out there fit to watch anymore. Nice selection of flora and fauna, Rose. I particularly enjoyed the 'scoop of clouds' and that spider. I hope you did not disturb Mabel....she is such a pretty girl....tho I am happy she is living in your garden and hot hours. Spiders and bats are not my favorites..but snakes so not bother me. Now what kind of sense does that make??? Love the taco shot of the lily leaves. That capture is an awesome. Some of your pictures just knock me off my feet they are so beautiful. Am trying to do commenting again today. Talk at you later (as Bud would say). Hugs.